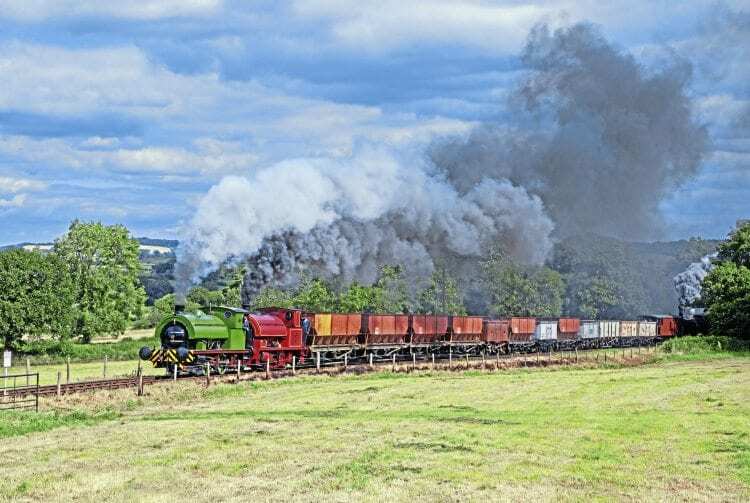 NEW faces, returning stalwarts and popular regulars made up the seven steam locomotives that starred in the Foxfield Railway’s anniversary gala on July 14-16. It was an event that commemorated the line’s 50th anniversary in typical ‘volcanic’ style! It would be fair to say the build-up to the event was a little fraught at times as the many gala stakeholders ‘burnt the candle at both ends’ in order to meet the gala deadline. For example, both Hunslet ‘Austerity’ 0-6-0ST No. 7 Wimblebury (3839/1956) and Robert Stephenson & Hawthorns 0-4-0ST Eustace Forth (7063/1942) only returned from overhaul in the weeks leading up to the gala, and at the beginning of July were still incomplete cosmetically as the final coats of paint were applied. Dübs 0-4-0CT No. 4101 had also been undergoing mechanical attention in the days before the gala, and the planned change of identities for ‘Austerities’ Wimblebury and Whiston (Hunslet 3694/1950) to run as Foxfield Colliery’s Dilhorne No. 3 and Arthur Leighton had to be scrapped after the vinyls used to masque the locos’ true identities were found to be the wrong colour. Teething troubles aside, when the weekend arrived the show itself did not disappoint. The railway had made a huge effort in terms of local promotion and the gala was well patronised, to the point where the printed gala brochures had run out by lunchtime on Saturday.